It All Started With a Vanilla Milkshake! 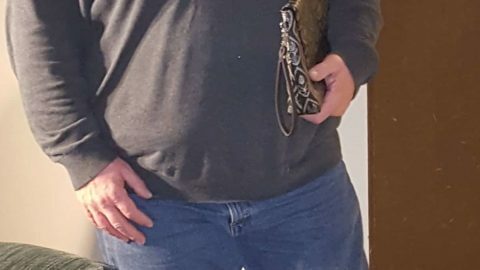 Home / Articles / Crossdressing Success Stories / It All Started With a Vanilla Milkshake! After a quick shower, I got dressed and did my makeup as best I could and put on my earrings, watch, necklace and wig-snapped a few pics in the house and grabbed my purse. I walked about three houses up the street before running into someone exiting their house, and I hastily crossed the street in a U-turn and headed back home. I had an errand to run-checking on my sister’s house while they were out of town-, so I decided that Cynthia would do that too. I need some cash, so I stopped by the ATM –a drive by one- and got the cash; as I did I realized my face would be recorded but figured that unless I myself reported some kind of fraud, there was no reason anyone would care. Next I realized I needed to get gas so I headed to BJs Wholesale club and selected the pump furthest away from the others and the attendant’s shack. Setting my camera up to record the “event” for posterity, I stepped out of the car-as gracefully as I could manage-and ran the card through the pump and began pumping gas. There were only two other cars for the 10 pumps, so I felt somewhat relaxed standing there pumping the gas facing the front of the car when suddenly another car pulled up directly behind me—despite there being other pumps available! This startled and frightened me a bit but there was nothing to do but to finish pumping the gas-which I did without turning around! Upon finishing, I replaced the gas hose and the gas cap cover and got back in the car-again as gracefully as I could manage and drove off to another part of the parking lot without even fastening the seatbelt. I stopped and retrieved the camera and watched the video of a nervous Cynthia pumping the gas but not cringing as I thought she might have been doing while it was happening. Reaching the ordering box, they asked me what I wanted and I told them –using a slightly higher pitched and softer voice- that I wanted a vanilla shake with no cherry and no whipped cream (I had to repeat it too). She gave me the total and I slowly pulled around for the moment of truth-being seen close up and interacting. The window opened, and she handed me a straw and napkin while I handed her a $10 bill which she took, and the window closed briefly. I breathed for the first time in a minute or two then the window opened and she handed me my change. Another 30-60 seconds passed-then the window opened again and she handed me my order, and told me “thanks for coming, here’s your shake”. I replied “thank you” in a soft voice and drove away. There were no lightning bolts raining from the skies; no sinkholes opened up to swallow me and my car; and no angry villagers with torches and pitchforks chasing me down! Also no laughing or finger pointing to make fun of me and no stares or smirks or gathering at the window to look at the “lady” ordering her shake – at least not while I was there-who knows what may have occurred after I pulled away. LOL! And just like that it was done! My first interaction in public as Cynthia! And it was a success! The fears had been groundless-no one seemed to care and/or notice who I was and that was the best compliment I could ask for. Blending In! Heading for home, I picked up the phone and called my friend who had been giving me encouragement and told her about my adventure on the drive home and then I went to the chat room and laid it all out for the folks there. I was showered with compliments and congratulations which just capped off a momentous night in Cynthia’s journey! I’m writing this not so much as a “look at me” story but as encouragement to take the step you’ve been hesitant to take in your own journey! Everyone had been telling me how my fears of the unknown reaction were likely far worse than the reality of what would occur. Intellectually I knew they were right, but fear had always stopped me before! Tonight, I took the leap of faith and took the first step out of my comfort zone and it was amazing! While still incredibly nervous and terrified, and my pulse racing, I also felt so alive and natural being out as Cynthia and it just felt “right”. I don’t know what the next step of my journey will be-perhaps getting out of the car and venturing in somewhere or maybe something else I haven’t thought of yet. But I now know that this was not the final step but only the first step of many on my journey to unleash the woman who has been longing to be out in the world for over four decades! PS-As one of my dear friends said, the phrase “going out for a milkshake” will never mean the same thing to me again, and every time I hear the word “milkshake”, I will be reminded of this special night in my life. Many crossdressers are happy to blend in when they are out and about but now and again there are those with great daring who go well beyond that. Join Anna on her continuing journey as she proves that if all the world is a stage then she has her own part of it. Have you ever told anyone who you really are on the inside? Someone outside this comfortable setting? I did that a couple years ago and it was a very liberating, exciting experience. JamieGhee’s Crossdressing Success Story – Out The Closet And Into A Ball Gown! JamieGhee leaps out of the closet and into a ball gown in this compelling story of crossdressing success.